If you’re a type of player who likes to discover hidden gems, and guitar wireless systems are your current area of pursuit, allow us to introduce you to Nady U-1100 GT, a cheap system that operates like a true beast for the listed price. Nady is hardly a household name such as Line 6 or Shure, and we believe that’s the exact reason why the manufacturer had to offer a stellar value for money in order to attain its share of the market. We believe this is one mean machine, check out the full review below to see whether you agree. The very first thing we noticed about this thing is a whopping, staggering range of 500 feet (150 m)! This is something we haven’t encountered even with high-end items, which usually have a range of up to 300 feet. In our humble opinion, this is way more than anyone would need, but the great thing about such an extended range is the fact that even when you’re lengthy 250 feet away from the transmitter, you’re still well within the safe zone of strong signal. In general, this specific model has been tailored to match the needs of guitar and bass players. It covers all the frequencies quite well, utilizing a convenient LCD display, a 3.5-mm locking connector, and a 120 dB dynamic range. This is a UHF type of wireless transmitter, which you can consider as the second best option, weaker than high-end digital devices and far superior to old-school VHF systems. In total, the user is given a set of 100 selectable frequencies. As far as controls go, there’s the basic on/off switch, there’s a Volume knob, and there are two Set buttons. The user is granted the ability to manually adjust the frequencies, or can set the frequency settings to Auto regime. Thanks to the advanced IF filtering, you can control and utilize up to 10 transmitters at one location, which is a pretty impressive figure. Also included in the mix is an RF/ AF bar graph, a balanced XLR fixed microphone level, an adjustable and unbalanced 1/4-inch jack, and the ability to adjust the squelch, or RF mute. When it comes to performance, it’s pretty good for the listed price. The sound quality is high level, with minimum compression and high authenticity to the original signal. However, this is a UHF device after all, meaning it’s more prone to audio interference than the fancy digital systems. In practical terms, this means that you should leave the signal path between the transmitter and the receiver as clear as possible, as interfering with objects can result in signal weakening. It’s not a big deal, but still something to keep in mind. 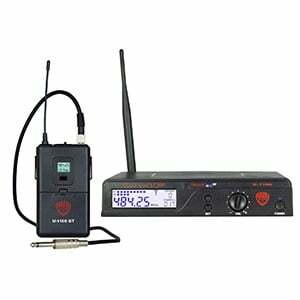 When all factors are combined, the Nady U-1100 GT guitar wireless system offers stellar value for money. It’s like a standard UHF wireless system, but steroids! There’s the extended range, solid signal clarity, enhanced signal strength, and a healthy chunk of advanced features with great ease of use. You wanted a hidden gem, you got it! For more info about Nady U-1100 GT, click here. To whom it may concern, I bought this system. I bought a few months ago. And I only used it a couple of times for About 30 mins each time. System seems really nice except the cheap instrument cable. It’s very weak. The part you plug into the guitar , just spends and is not straight. I havnt used it since. I have been trying to find a replacement cord. Something that will work good. But I am not sure what cable and can’t find a pinout? Could you please tell me so I could buy a new better , stronger cable that really works? Any help would be greatly appreciated. I paid $130 for the unit new and would love to use it.